This collection of short stories is going to be amazing. And I cannot wait for it to come out in August. It sounds so good. 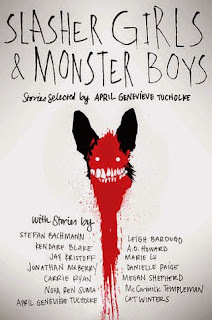 And I cannot wait to read the short stories by so many authors that I love :D And I love horror too, so yeah. This one shall be awesome, I hope. I adore Leigh. And Kendare. And Jay. And Marie. And Carrie. And Nova. And Cat. And the other authors sounds amazing too :D I simply can't wait for it. What are you waiting for on this horrific Wednesday? Okay, I added this to my TBR. It's an anthology! I love anthologies. Great pick! I'm waiting for Library of Souls (Miss Peregrine's Peculiar Children #3) which is in theme with your pick, I guess. New to me but great pick. Hope you get a chance to read it soon. SOOO many great authors packed into this one! Very excited and I hope you love it, Carina! This one sounds so good! And so many awesome authors, including one that I am featuring a book by today in my post. I think this was my WoW choice last week (or the week before?). I can't wait to read these stories! Usually I'm not an anthology person but I see April's name on there so... yes :D I hope you enjoy this book when you read it! I've been dying for this one, too! I love horror when it's done well and there are so many great/atypical authors in this anthology. Nice pick! I've been seeing this one around, and it looks SO good!!! Very creepy and intense.